Former Maryland Gov. Martin O’Malley speaks at a fundraiser for Calvin Ball, standing behind him. MarylandReporter.com photo. Former Gov. Martin O’Malley was the star attraction at a fundraiser for Howard County Councilmember Calvin Ball and his campaign for county executive against incumbent Republican Allan Kittleman, whose name wasn’t mentioned in the short speeches at the event Wednesday evening. Ball, who was term-limited after 12 years on the council, supported O’Malley’s first run for governor in 2006 and served on his transition team for education. O’Malley appointed him to the Maryland Sustainable Growth Commission and the Commission on Environmental Justice and Sustainable Communities, which Ball chaired. Neither Ball nor Kittleman have primary opponents, so they will face each other on the November ballot. Kittleman has just released his first TV ad running on cable. As of January he had $825,552 cash in his campaign account, and Ball had $223,733. 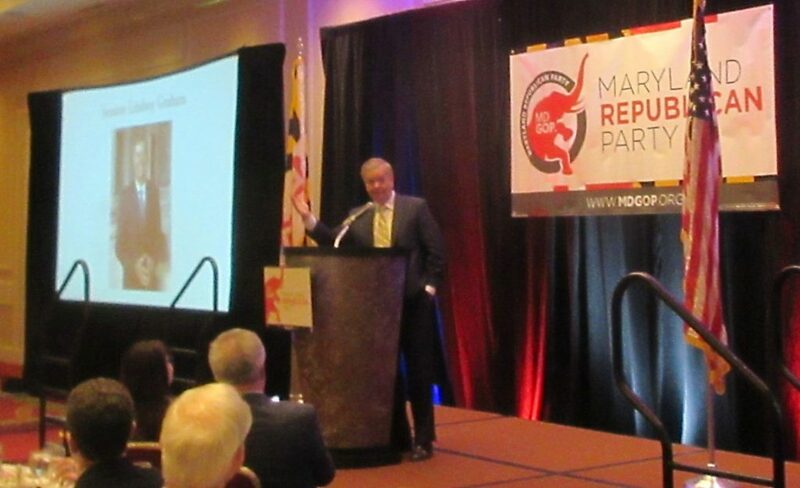 U.S. Sen. Lindsey Graham of South Carolina gave a laugh-filled speech to the Maryland Republican Party’s annual Red White and Blue dinner at the BWI Marriott Tuesday night. Graham, one of the 16 Republicans that Donald Trump beat on his way to the GOP presidential nomination, said the president reminds him all the time of the negative remarks the senator made about Trump during the campaign. In his self-deprecating, humorous talk to several hundred Republicans, Graham also had some backhanded compliments for the unpredictable president. Graham also praised Maryland Gov. Larry Hogan, who was represented at the dinner by Lt. Gov. Boyd Rutherford. Rutherford introduced Graham after he listed the administration’s accomplishments. “We had friends who told us that we weren’t going to win,” Rutherford told the crowd. He asked the audience not to take anything for granted in this election year.